Final Fantasy X is a RPG developed and released by Square Enix for the PlayStation 2 in 2001. It marked a few key milestones for the venerable Final Fantasy series. It was the first in the series to move away from static sprites or pre-rendered graphics, presenting the entire game in a real-time 3D environment. It also featured voice acting, adding further to the cinematic experience. 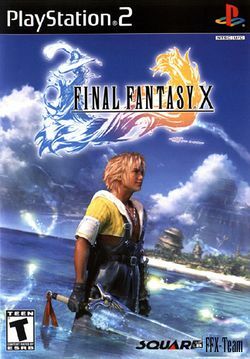 It was also the first in the series to spawn a direct sequel, Final Fantasy X-2. Square Enix announced a remake for the PlayStation 3 and PlayStation Vita at Tokyo Game Show 2011 to celebrate the game's 10th anniversary. On March 18th, 2014 Square Enix released their remastered remake of Final Fantasy X along with a remaster of its sequel and bonus content entitled Final Fantasy X/X-2 HD Remaster. It is currently available as a one disk set or download for the PlayStation 3. A FFX game cartridge and FFX-2 download is available for the PlayStation Vita. In May 2015, the remastered version was released on the PlayStation 4. North American PS3 Collector's Edition cover. The remaster edition's North American PS Vita advertisement. The remaster edition's Japanese PS Vita box. PS Vita remaster edition with "Twin Pack" printed on the cover. This page was last edited on 13 April 2019, at 15:19. This page has been accessed 323,040 times.